Home / Blog / CMS Commander Enables You to Bulk Manage All Your Websites From One Account. Sign Up For Free Now! CMS Commander is a remote management software for WordPress, Drupal, Joomla and phpBB websites. Simply add all your websites to your CMS Commander account and then contrl them all through a secure SSL connection. Save lots of time by bulk managing your site network with all of CMS Commanders features: Install new plugins on all your websites simultaneously, automatically update plugins and themes when new versions are available, create automatic backups of all your sites, remotely manage user accounts, articles, comments and much more! 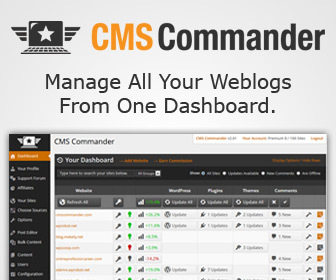 Sign up for your free CMS Commander account now!